The Kentucky Derby is legendary, not only for big crowds but for big hats, too! 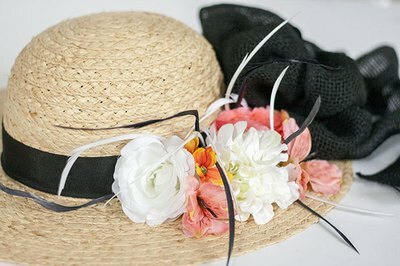 From English-inspired fascinators to the classic wide-brimmed silhouette, oversized and exuberant hats are a Derby tradition. But, happily, your budget to recreate this high society look doesn't have to be quite as lofty. Using simple craft store materials, you can easily cheer on the horses and riders in style. 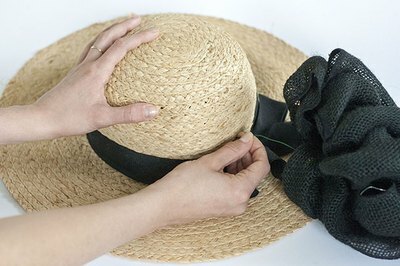 For this project you'll need a large straw hat with a wide brim. 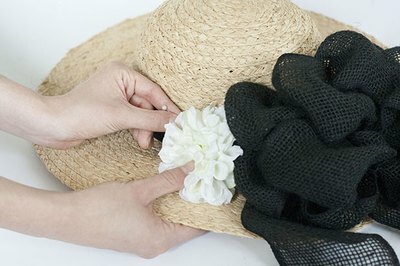 The wider the brim, the more embellishments you'll be able to add. You'll also need a selection of silk flowers, a pre-made bow (the kind typically found in the wreath-making section of your local craft store), pearl-tipped floral pins, floral wire and feathers. 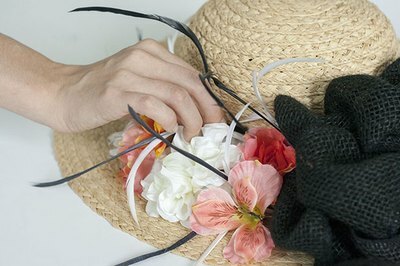 Attach the bow to the straw hat using floral wire, which should already come threaded in the wreath bow. 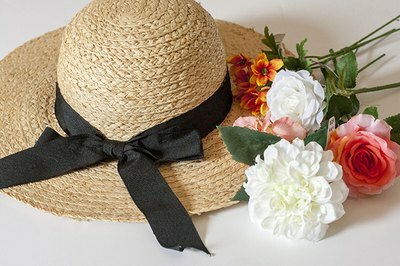 To attach it to the hat, shimmy the wire through the fibers of the straw hat somewhere between the brim and the top of the hat. With the bow in place, it's time to add the flowers. When choosing your flowers at the craft store, pick buds within a palette of three to four different colors. Here, a coral, pink and white scheme was used. Remove the silk blooms from their plastic stems and add them one by one. Begin with the largest blooms, like this oversized white garden rose, then fill in with the smaller flowers in a tight cluster, mixing the colors for maximum variety. 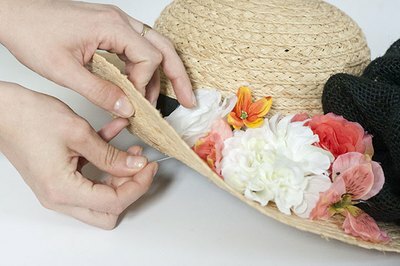 To add your flowers to the straw hat, slip floral pins through the silk petals and into the straw. Approach it in the same way you would to attach a boutonniere to a suit collar. For a little extra height, push tall feathers between the flowers. 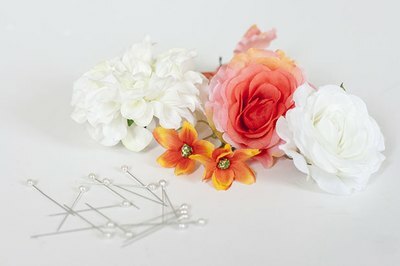 The tight configuration of the flowers should hold the feathers in place, but if you feel like you need extra hold, you can use floral pins or wire. Feel free to play around with the amount of feathers you add or how big you want your bow to be. 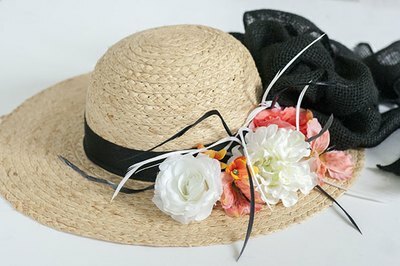 Whatever your style, this hat is the perfect accessory for any Kentucky Derby celebration.